In the Book of Roger (Kitab Ruyar) or “Nuzhat al-mustaq fi ikhtiraq al-afaq”, compiled AD1153 for King Roger 2nd of Sicily by Mohammad al-Idrisi, (which is an Arabic script text and it is doubtful that it was read by many Normans), he chooses to subdivide the Oikoumene into seven climates, taking the number, but not the latitudinal spacing from the text of “Geographia” by Claudius Ptolemy. Each climate, which is made an equal latitudinal division, is then subdivided into ten divisions of equal longitudinal length. Then one diagram or map was drawn for each of the subdivisions of the world map, 70 in total plus one extra map representing the Oikoumene. But how were these 70 maps constructed? 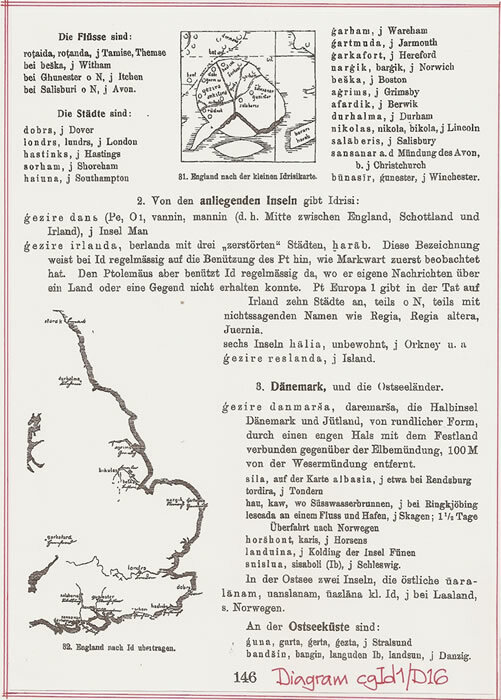 L’Angleterre is described in Climate 7, Sections 1 and 2 although in the text al-Idrisi comments that Section 1 has not been drawn as it is purely Ocean, the text actually indicates that it contained islands. Thus there is one short text and a single diagram to be analysed and the conflict resolved. It is written in Arabic and has only been wholly translated into German, Latin and French. The French text is available on line and although dating from 1860 and being somewhat criticised for its notation regarding place name translations, in fact it is the only text available and capable of normal usage. It is from the Bibliotheque Nationale’s text reference “arabe 2221” and includes all 70 (69) sectional diagrams and one World Map. The Bodleian Library, Oxford, has a complete copy, reference “MS Pococke 375” and a partial copy reference “Greaves 32”. Other copies exist in Cairo, Istanbul, Leningrad and Sofia. Included in the appendices is a reference to these by A F L Beeston which explains the inter-relationship of these copies. It also indicates that there are possible transcription errors within them, that is, normal scribal errors to be found in many manuscripts by miscopy and misplacement of text. 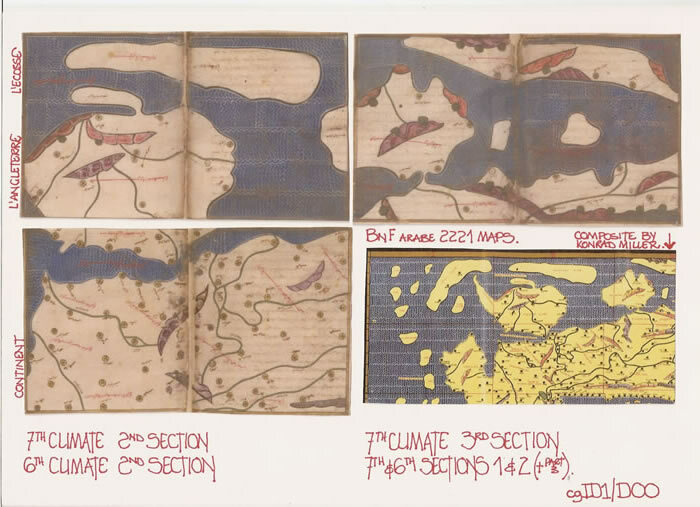 S Maqbul Ahmad in chapter 7 of “The History of Cartography” also includes a list of known copies and their situation vis a vis maps and completeness of texts (see bibliography). The French translation of the complete text of Al-Idrisi by Jaubert. The fact that there are no later papers speaks volumes for the lack of research into so great a Geography. 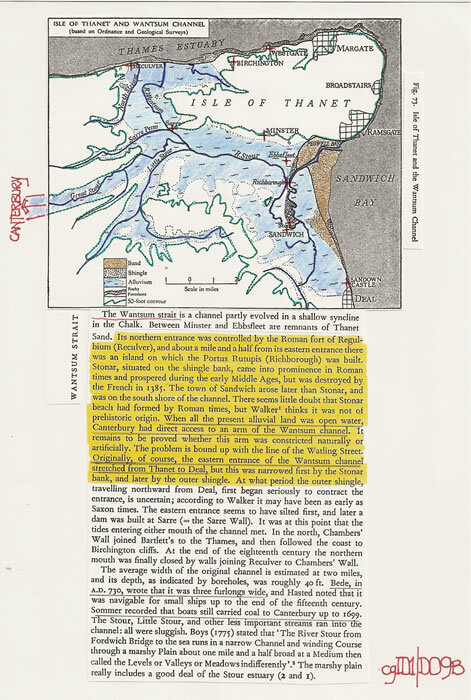 As stated, it should be noted that the description as found in the original text and the maps which accompany the text are at variance regarding what is contained in a single section of a Climate. This variance is discussed fully in the third text of this investigative series, referenced cgId3. The Norman (Viking) homeland was basically the southern portion of Scandinavia and the Danish Peninsula. From there they travelled, and by attack and conquest they founded three kingdoms and commenced a fourth, The Rus. We are here-in concerned with Britannia, Anglo-Saxon England which from the Roman period for centuries was a stable country. 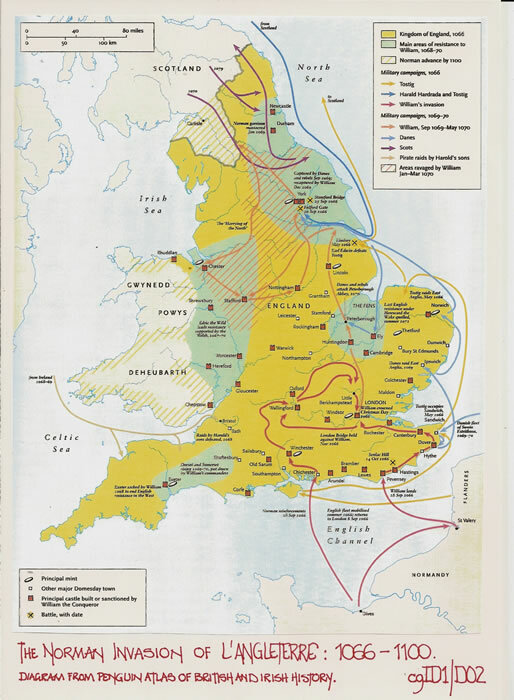 Then to the invasion of the Jutes, Angles and Saxons when it fragmented into a Danish/Norwegian/Anglo-Saxon territory and finally pre 1066 when there was a semblance of autonomy as ‘England’, which culminated in the House of Godwin. Then came a climactic time in England’s history: the final battle between the Anglo-Saxons or English and the Norwegians at Stamfordbridge in early 1066, which was followed by a defining battle, the Norman invasion on the 14th October 1066, and the Battle of Hastings. Thus as we arrive at this climactic in English history we may reduce the historical background as it affects this paper and the text of al-Idrisi to a simple resume. The King of Sicily, Roger 2nd was a Norman and thus in contact with the homeland, Normandy France, as well as the newly acquired Kingdom of L’Angleterre of Duke William. L’Angleterre prior to 1066 was an Anglo-Saxon country and comprised a Kingdom from Cornwall to Northumbria. It was a Christian country with Archbishops of Canterbury and York and established counties with Burgs. Certainly it was prosperous, but with many small villages and towns that were hardly larger than villages, it was basically a rural population as the Domesday Book of 1086 illustrates. There were exceptions, London, York and Winchester among them. It also had no major fortifications which would accord with the Roman Fort system or the later Norman Motte and Bailey system. Hill forts, ditched enclosures and the like were still de rigueur. They had trading ports or wics, namely Hamwic/Southampton; Gipeswic/Ipswich; Lundenwic/London and Eoforwic/York. Thus the arrival of the Normans in 1066 and the immediate establishment of Motte and Bailey fortifications had an overwhelming impact upon the populace. It is those fortifications which gave rise to new towns and it is those fortifications that the Norman Landscape of L’Angleterre was to be known by. These were built in unprecedented numbers to put down and prevent further rebellions. Initially mostly on the Motte and Bailey pattern but later as stone castles and it is these which also changed the urban landscapes of towns such as Norwich, Durham and Lincoln. The problems for the Normans were however just beginning. With the Norman invasion came the possibility of all the previous invaders gaining ground and certainly they exploited the situation. The overall campaigns can be expressed in a single diagram. However when the text of al-Idrisi is read the situation in England is painted as a tranquil prosperous country. That is far from the truth. It was a country in turmoil, widespread rebellions and incursions by the Danes, Norwegians and Scots were prevalent. But the military machine of the Normans prevailed and England, L’Angleterre sank into a century or more of strife. Thus we must see the text of al-Idrisi as a biased document, but, as he was fed the information perhaps the bias was not of his doing and he knew no better. As stated for our purposes the translation by Jaubert commencing with the 7th Climate, 1st Section, “Irlande et Ecosse”, comprising 17 lines and 2 notations and the 2nd Section entitled “Angleterre”, comprising 106 lines with 6 notations is being used. The translation by A F L Beeston of those sections comprises 84 lines, but he has also produced a commentary (and the Arabic text,) comprising some 62 items. Unfortunately there is conflict between the two texts as one would expect with translations. The simplest method of illustrating the French and English texts is to allow them equal exposure in a two section format. But it must be recognised that they are not to be taken line by line as equivalent. Et de l’autre à l’île déserte de Scosia (Arabic) d’Ecosse, 2 journées. Cedependant l’auteur du Livre des Merveilles rapporte qu’il existait autrefois, dans cette dernière île, (en Ecosse) trois villes; que l’île était habitée; que des navires y abordaient et y jetaient l’ancre pour y acheter de l’ambre et des pierres de couleur; que quelques-uns d’entre sers habitants ayant voulu subjuguer les autres et régner sur eux, il s’ensuivit des guerres civiles, des inimitiés, des ravages à la suite desquels une partie des habitants émigra sur le continent, en sorte que leurs villes restérent désertes et ruinées. The first section of the 7th climate is altogether Ocean, and islands which are desert and uninhabited. The largest of its islands is that of Ireland, which has been mentioned before. This large island, of which the topmost point is three and a half days’ sailing from the land of Brittany, while its lower extremity is two days sailing from the deserted peninsula of Scotia. The author of “the Book of Marvels” states that in it are three towns which used to be inhabited, and ships used to put in there and visit there, buying from the inhabitants amber and coloured stones: but one of them sought to make himself ruler over the rest, and waged war on them with his folk. And they fought in defence against him; thus enmity arose among them and they fought each other to extinction; some of them migrated to the opposite shore of the continent, and not a single inhabitant was left in the towns. La présente section comprend la partie de l’ocean Ténébreux où se trouve L’Angleterre (Arabic), île considérable, dont la forme est celle d’une tête d’autruche et où l’on remarque des villes florissantes, de hautes montagnes, de grandes rivières et des plaines. Ce pays est fertile, ses habitants sont braves, actifs, entreprenants; mais il y règne un hiver perpétual. La ville la plus prochaine du continent est Wadi-Sant (Arabic) [Wissant? ], qui appartient à la France (Arabic); et la distance qui sépare l’île du continent est de 12 milles. Au nombre des villes d’Angleterre situées a l’extrémité occidentale et dans la partie la plus étroite de cette île, il faut compter Sansahnar (Arabic) [Chichester? ], a 12 milles de la mer. Elle est jolie, florissante et sur les bords d’une grande rivière qui vient du côté du nord et qui se jette dans la mer à l’orient de la ville. De là à Gharham (Arabic) [Wareham], en suivant le rivage, on compte 60 milles. Et au cap le plus occidental de l’île, 380 milles. A Djartmouda (Arabic) [Nordmuth, aujourd’hui the Nore], 80 milles. La partie la plus étroite (littéral. La plus mince) de ce cap ressemble à un bec d’oiseau. De Sansahnar (Arabic) à Salaberis (Arabic) [Salisbury? ], dans les terres, du côté du nord, 60 milles. Salisbury est une jolie ville, située sur la rive orientale de la rivière qui se jette dans la mer auprès de Sahsenar. De la ville de Gharham (Arabic) [Wareham] au cap Haïouna (Arabic) [Corfe-Castle] qui s’avance dans la mer, 25 milles. Sur ce cap, du côté de l’orient, est Haïouna, ville florissante, auprès de laquelle, du côté de l’orient, se jette la rivière de Ghounester (Arabic) [Winchester]. Ghounester est une ville située dans l’intérieur des terres, à 80 milles de Haïouna et à 40 milles de Salaboures (Arabic) [Salisbury? ], en se dirigeant du côté de l’occident. La rivière de Ghounester prend sa source dans des montagnes qui s’étendent au centre de l’île(de l’Angleterre). Here-in is the second section of the seventh climate, containing a portion of the Ocean where-in lies the island of L’Angleterre. This is an island resembling the head of an Ostrich, and contains flourishing cities, lofty mountains, flowing rivers and level ground. There is abundant fertility in it. Its inhabitants are hardy, resolute and prudent. The winter there is of long duration. The nearest land to it is Wadi-Sant [Wissant] in the country of Flanders. Between this island and the main continent is a strait 12 miles wide. Among its towns which are in the extreme west of this island and towards its narrowest part is the town of Ceastre [Dorchester? ]; between this and the sea is 12 miles. It is a handsome flourishing town situated on a large river which comes to it from the north and debouches into the sea eastwards of it. From this town to the town of Wareham along the coast is 60 miles. Moreover from the town of Ceastre [Dorchester?] 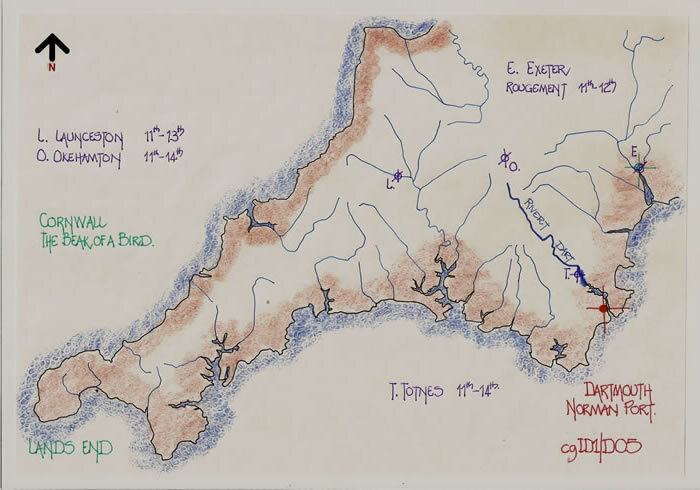 to the western extremity of the island is 380 miles, and also from it to the port of Dartmouth is 80 miles, and thence to the extremity of the island, which is called Cornwall is 300 miles; this narrow portion of it resembles a bird’s beak. From the town of Ceastre [Dorchester?] also to the town of Salisbury, which lies inland northwards, is 60 miles; the latter is a fine town lying on the east bank of the river which debouches by the town of Ceastre [Dorchester?]. From Wareham also to the point of Hantune, which is a promontory jutting out into the sea, is 25 miles. Beside this on the east lies the town of Hantune [Southampton]; this is a flourishing town and on its eastern side debouches the river of <Win>tuncaestir [Winchester]. This is an inland town and between it and Hantune [Southampton] is 80 miles. From <Win>tuncaestir [Winchester] to Salisbury is 40 miles westwards. 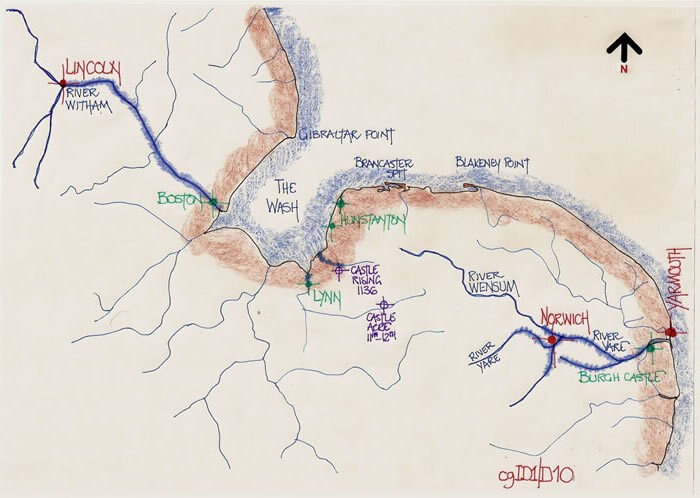 The river of <Win>caestir [Winchester] issues from a mountain lying crosswise in the midst of the island. De Haïouna (Arabic) a Chorham (Arabic), 60 milles. Cette dernière ville, située sur les bords de la mer, est belle et bien peuplée. Il y a des chantiers de construction et des édifices (publics). De là à Hastings (Arabic), ville considérable, très-peuplée, avec nombreux édifices, des marchés, de l;industrie et un riche commerce, en suivant la côté, 50 milles. De là, en suivant la côté et en se dirigeant vers l’orient, à Dobres (Arabic) [Douvres], ville également importante, située a l’entrée du détroit qui sépare (L’Angleterre) du grand continent, 70 Milles. De Douvres à Londres (Arabic), ville de l’intérieur des terres, située sur les bords d’un fleuve qui se jette dans la mer entre Douvres et Djartmouda (Arabic), jolie ville du littoral, 40 milles. De Douvres à l’embouchure du fleuve de Londres, 20 milles. De cette embouchure à Djartmouda, dont il vient d’etre question, 40 milles. Et par mer, de Douvres à Djartmouda, 60 milles. Le fleuve de Londres porte le nom de Rothaïda (Arabic) ou Rothanda (Arabic) [La Tamise]. Il est considérable et rapide. Il prend sa source vers le centre de l’île, coule près de Gharcafort (Arabic) [Wallingford] à 50 milles de sa source, passé au midi de cette ville, se dirige durant l’espace de 40 milles vers Londres, puis va se perdre dans la mer. De Djartmouda (Nordmuth) à Barghik (Arabic) [Ipswich? ], ville distant de 10 milles de la mer, 90 milles. Et de Barghik à Aghrimes (Arabic) [Lynn-Regis] sur mer, 80 milles. En sorte que la distance totale de Djartmouda à Aghrimes, par mer est de 150 milles. A partir de Djartmouda la mer forme un golfe de forme circulaire don’t la direction est vers le nord. D’Aghrimes, ville ci-dessus mentionnée, à Afardik (Arabic) [Berwick], autre ville située à une certaine distance de l’océan Ténébreux, et vers l’extrémitée de l’île d’Ecosse qui est contiguë (Arabic) a l’île d’Angleterre, 80 milles. L’Ecosse s’étend en longueur au nord de la grands île. Il n’y a ni habitations, ni villes, ni villages. Sa longueur est de 150 milles. D’Afardik (Berwick) à l’embouchure de la Beska (Arabic) [de l’Esk], 140 milles. Beska est aussi le nom d’une place forte, bâtie sur les bords de la rivière de ce nom, a 12 milles de la mer. D’Aghrimes à Nicola (Arabic) [Lincoln], dans l’intérieur des terres, 100 milles. La fleuve traverse cette dernière ville par le milieu, se dirige ensuite vers Aghrimes, et décharge ses eaux dans la mer, au midi d’Aghrimes. De Nicolas (Arabic) [Lincoln] l’interieure à Afardik (Arabic), 90 milles. Puis, en se dirigeant vers le nord, à Durhalma (Arabic) [Durham], ville située à une certaine distance de la mer, vers le nord 80 milles. From Hantune [Southampton] to the town of Shoreham is 60 miles. The latter lies on the edge of the sea and is a fine and cultivated city containing buildings and flourishing activity. From there along the coast to the town of Hastings is 50 miles. This is a town of large extent and many inhabitants, flourishing and handsome, having markets, workpeople and rich merchants. From there along the coast eastwards to the town of Dover is 60 miles. This is also a large town, and is situated on the edge of the strait whereby one crosses over to the neighbouring Continent. From the town of Dover to the town of Londres inland is 40 miles; this is situated on a river which flows into the sea between Dover and Gernemutha (Yarmouth). The latter is a handsome town beside the sea. From Dover to the estuary of the river of Londres is 20 miles by sea, and from the estuary of this river to the said town of Gernemutha is 40 miles; so that from the town of Dover to Gernemutha by sea is 60 miles. The river of Londres is named [Thames]; this is a well-flowing river with much water. Its course is from the middle of the island, whence it reaches the town of [Oxford] at a distance of 50 miles, and it then passes south of [Oxford] and flows on to the city of Londres, another 40 miles, and then it flows on from Londres to empty into the sea as we have mentioned. From the town of Gernemutha to the town of Norwicca (Norwich) is 90 miles. The town of Norwicca is distant10 miles from the sea, and from there to Grimsby is 80 miles by sea, so that from the town of Gernemutha to Grimsby is 150 miles by sea. From the said town of Gernemutha the sea(-coast) curves round in a circle, but still trending northwards. From the said town of Grimsby to the town of Evrvic (York) is 80 miles. The latter lies at a distance from the Ocean, and on the border of the peninsula of Scotia, which is contiguous with the island of L’Angleterre. It is a long peninsula stretching northwards of the larger island; it has no flourishing cities, towns or villages; its length is 150 miles. From the town of Evrvic to the estuary of the river of (Boston) is a 140 miles, and (Boston) is a fortress situated on this river 12 miles distant from the sea. 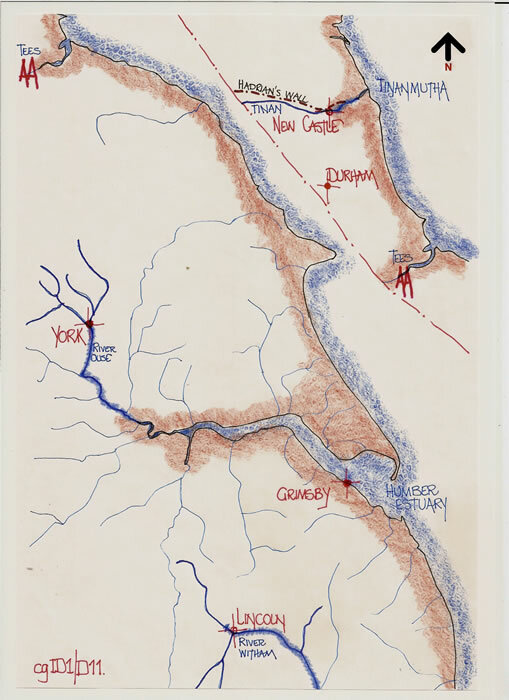 From the aforementioned town of Grimsby to the town of Nicolas (Lincoln) inland is 100 miles; the river flows through the midst of it and flows out of it towards the town of Grimsby, but flows into the sea south of the latter, as we have mentioned before. From the inland Nicolas to the town of Evrvic is moreover 90 miles, and from there to the town of Donelme (Durham) 80 miles northwards. The latter is at a distance from the sea. Entrée l’extrémité de l’Ecosse, île déserte, et l’extrémité de la Hirlanda (Arabic) [de l’irlande], on compte 2 journées de navigation, en se dirigeant vers l’occident. L’Irlande (Arabic) est une île très-considérable. Entre son extrémité supérieure et la Bretagne on compte 3 journées et demie de navigation. De l’extrémité de l’Angleterre (Arabic) a l’île de Danes (Arabic) 1 journée. De l’extrémité de l’Islande a celle de l’Irlande la Grande, 1 journée. De l’extrémité de l’Islande, en se dirigeant vers l’orient, a l’île de Norbagha (Arabic) [Norwége], 12 milles. L’Islande s’étend sur un espace de 400 milles de long sur 150 milles de large. From the extremity of the deserted peninsula of Scotia to the extremity of the island of Ireland is two days’ sailing westwards; of the latter we have already spoken. From the extremity of the island of Angleterre to the island of DNS is one days’ sailing. From the extremity of Scotia northwards to the island of RSLANDA is two thirds of a days’ sailing. Between the extremity of the island of RSLANDA and the extremity of the large island of Ireland is one days’ sailing. Moreover from the extremity of the island of RSLANDA eastwards to the island of [Orkney] is 12 miles. The length of the island of RSLanda is 400 miles and its breadth is 150 miles. We will mention these islands later. This is the total text concerning L’Angleterre, L’Ecosse et L’Irlande. Jaubert in his translation does not attempt to comment, it is purely a translation. But Beeston does add a large commentary which precedes his translation and uses knowledge for those comments which was not available to al-Idrisi. That is he is obviously looking at a geographical map to write his text and comments is easily illustrated. 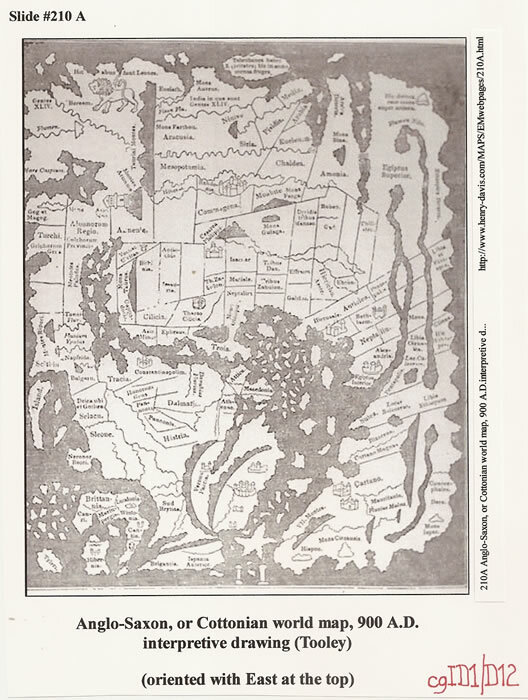 My example to indicate that is as follows; Beeston Note 50 states, “The circular recess of the sea to the north of Yarmouth evidently refers to the Wash, though Jaubert failed to understand this”. But the actual translation of Al-Idrisi’ text given by Beeston states, “From the said town of Gernemutha (Yarmouth) the sea (-coast) curves round in a circle, but still trending northwards”. Jaubert has the following, “A partir de Djartmouda la mer forme un golfe de forme circulaire don’t la direction ets vers le nord”. Surely that French text states quite clearly there is a Gulf, that is The Wash to the north of Yarmouth, and thus Jaubert has perhaps appreciated the geographical situation better than Beeston. Thus we can consider that Beeston is observing a map of Britannia and not solely translating the text of al-Idrisi to follow its instructions. It is as if Beeston is trying to fit al-Idrisi’ text to geographical fact and not portray what the text actually states. Perhaps the most important description of L’Angleterre by al-Idrisi is that”This is an island resembling the head of an Ostrich”. This has been totally ignored by Beeston, but it is the answer to the strange coastline which is derived from the text. If the translation by Beeston is used as a set of instructions to draw a map of L’Angleterre, then surely al-Idrisi’ comparative description must be the basis of that map, or why would al-Idrisi make the comparison in the first place. However the first hurdle to overcome is to remember that al-Idrisi has drawn his map with South to the top of the page, contrary to our normal methodology and thus the Head of the Ostrich must be inverted if we are to draw a map of L’Angleterre to our normal methodology. There is another significant section within the text of al-Idrisi which impacts upon the shape of L’Angleterre and must fit to the shape of the Ostrich head and that is the section mentioned above as being a contrast of the two translations, the curve of the coastline. This is the first appearance of a notation that the coastline of L’Angleterre is anything but an east/west alignment. Even at Dover there is no notification that the coast turns northwards towards both the Forelands and then the Thames Estuary. 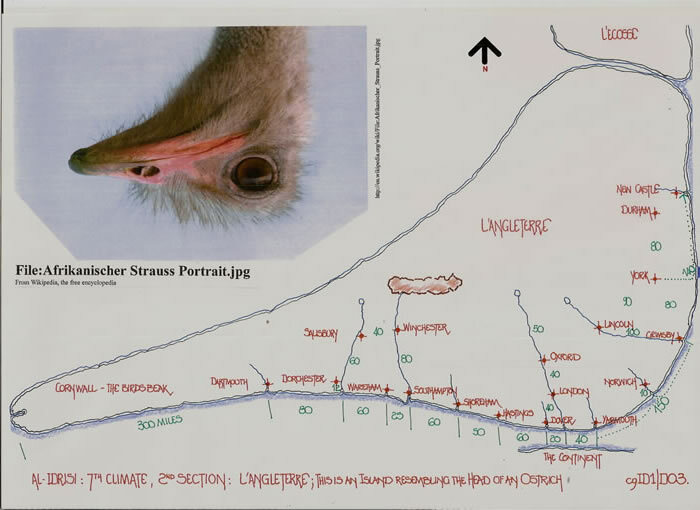 But if the map described by al-Idrisi is drawn as if it was the outline of an inverted Ostrich head, it becomes a reasonable explanation of the profile. However, to describe a physical object by likening it to an animal requires that the object, in this case a map, was already available for comparison. This point is discussed at the end of this text. 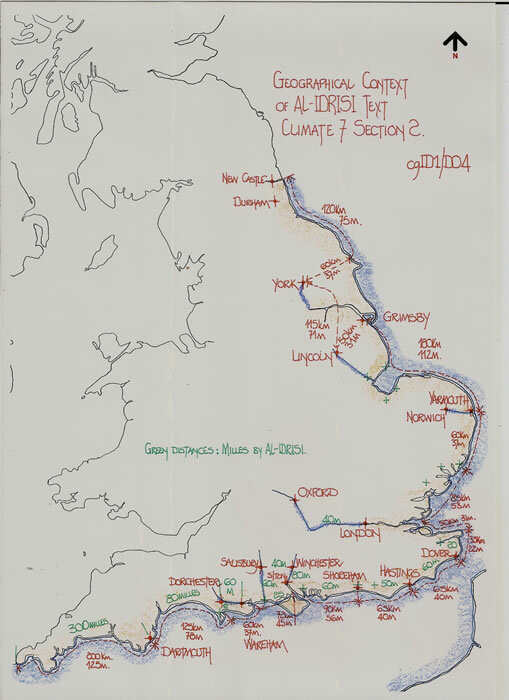 Thus the coastal description from Dartmouth to Grimsby and the Unknown site, with the internal sites can be evaluated, and the Unknown site, its sea journey and river can be determined. I would also draw your attention to the appendix, and part 4 of the D M Dunlop resume of “The British Isles according to medieval Arabic authors”, which have been highlighted for convenience. As the conquest of L’Angleterre proceeded Duke William instigated the construction of Motte and Bailey fortifications and as his henchmen were given new lands they built their own, with his agreement! Thus the progress of the Norman Conquest can be illustrated by these fortifications and their dates. We must also remember that these were not the Anglo-Saxon method of defence, but became a potent symbol of naked power and authority. The number of decent towns and large villages was pitiful in Anglo-Saxon England, and by the time Duke William had finished “harrying the North” it was a waste land. Thus we can immediately dismiss the P R text of al-Idrisi with his handsome and flourishing towns all over the country. He was writing for a Norman King, Roger 2nd of Sicily and the picture to be painted was one of a wonderful L’Angleterre under Duke William and his Norman followers. The Domesday Book is there for all to read and understand just what L’Angleterre was really like. But we can use the data transmitted to Roger 2nd in Sicily and placed within the text of al-Idrisi to evaluate the concerns of the Normans. There are 18 sites with distance measures in the text and each one of these sites bar one, Dartmouth (which is a special case), are in fact Motte and Bailey or Castle fortifications built soon after the invasion of 1066. If we compare the map of al-Idrisi to a geographical England we can see that the data transmitted to Roger 2nd was purely a military schedule of the island. It is doubtful that the Domesday Book or a part of it was included in that data, as the timing and transfer time of documents would be quite lengthy. DARTMOUTH, Derfamuthan, 11th C, mouth of river Dart. As a town it did not exist before 1066 but was only a village called Townstal, (Dunestal) at the top of a hill; Domesday Book 1086. Between 1086 and 1147 it grew from two small settlements on either side of a tidal creek to become a safe harbour for the Normans sailing to Normandy and the Channel islands. By 1147 it was well enough known to be the assembly point for a European Fleet setting out for the 2nd crusade. DORCHESTER,Roman Durnovaria, Dornwaraceaster 864, Dorecestre 1086 (DB). By 1086 it was only a town of several hundred persons and not exactly a handsome and flourishing town as described. The large river, The Frome although coming from the north is also north of the town centre and could be a misinterpretation as it is swollen by the Rivers Cerne and Sydling, but it is hardly large. 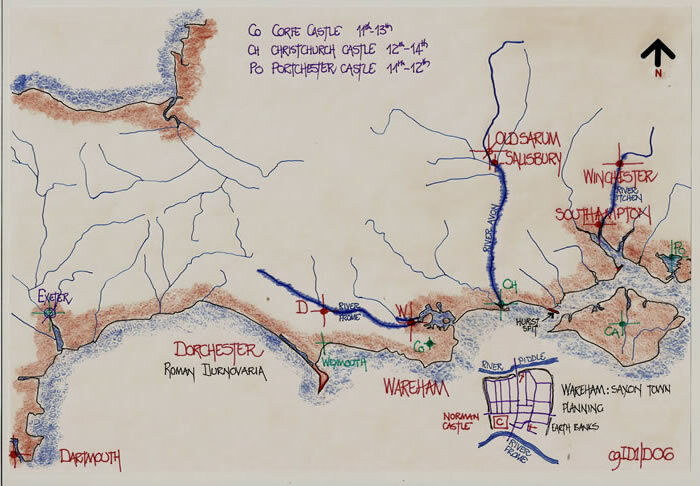 However it does debouch into the sea eastwards of Dorchester, but, that exit is at none other than at the next named site, Wareham, due east of Dorchester on the huge inlet which is Poole Harbour. The river debouches at the end of the Wareham Channel. Could there have been a conflation of the data and a certain misunderstanding. COMMENT; The port of Weymouth, Waimouthe c934, is 6 miles south of Dorchester and the logical landing point for access from the sea. It is also a large natural port. Has this been missed from the text as it is strange to commence such an undertaking with a minor inland town? WAREHAM; It is built on a strategic dry spit between the Rivers Frome and Piddle at the head of Wareham Channel. There was a small Roman Settlement of unknown name, but, the town was founded by the Saxons and is WERHAM in the Anglo-Saxon Chronicle. There is a Norman Motte and Bailey fortification on the banks of the Frome. South of Wareham is Corfe Castle another of Duke William’s fortifications which was constructed soon after the invasion. SALISBURY; Searobyrg, c900 and Sarisberie, 1086 (DB). The stronghold was at Sorvio. In fact it is on the banks of the River Avon at the junction of 3 rivers. But Old Sarum, Sorvio, the Iron Age defensive structure has the Castle of Duke William built within the earthworks of the Hill fort, and it was here in 1070 that Duke William paid off his invading army. But the River Avon debouches at Christchurch and not at Dorchester as al-Idrisi states. Thus the information is confused. But at Christchurch a Motte and Bailey fortification was raised in1110 by Richard de Redvers, cousin of Henry 1st. This mistake should be borne in mind when later comments regarding places and forts are discussed. SOUTHAMPTON/HANTUNE; It is correct that the river of Winchester, The Itchen, flows into Southampton Water on the East side of Hantune. But, Southampton Castle is an 11th century fortification. However it should be noted that in Portsmouth Harbour, at Porchester there is an earlier Keep and Bailey of the 11th century built within the walls of the Roman Fort of the Saxon Shore. The determinate for Southampton/Hantune is a spit of land, probably what is now Hurst Castle at the entrance to the Solent and not The Isle of Wight as Beeston infers (note 26). The distances preclude any such inference. But the spit of Portland Bill has already been ignored as was Weymouth. WINCHESTER; Ouenta c150, Uintancaestir c750 and Wincestre 1086 (DB). A Roman town called Venta with a suffix for the local tribe. It is one of the most important towns of Anglo-Saxon L’Angleterre, pre 1066 and King Alfred’s capital. It is set on a grid pattern settlement of streets which entailed the laying of some 15000 tons of flints to pave them. The Norman castle was built in 1067 immediately following the conquest. SHOREHAM; Sorham 1073 and Soreham 1086(DB). This is a port on the estuary of the River Adur. Coasting from Southampton Water after Portsmouth harbour there are several harbours, Pagham, Littlehampton and then Shoreham. It is as stated a sea voyage of 60 miles. But inland from Shoreham, 4 miles, is Bramber Castle an 11th century Keep and Bailey fortification. HASTINGS; Hastingas 1086 (DB) but earlier Haestingacaester c915 and in the Anglo-Saxon Chronicle of 1011 Haestingas. The route from Shoreham passes Newhaven estuary on the River Oure, rounds Beachy Head and then passes Pevensey, Roman Anderida, and the first castle built by Duke William in 1067 inside the walls of the Roman Fort. Pevensey Bay and its stretch of sandy beach affront the Pevensey levels was chosen as the landing site for the Norman Army. But Duke William quickly moved onto Hastings where he built Hastings Castle, a Keep and Bailey. But, Hastings does not have a harbour and even today the small fishing fleet is launched from the beach under the cliffs. DOVER; Dubris, 4th C, Dofras c700 and Dovere 1086 (DB). It is named from the stream now called the Dour, but the celtic river name “Dubras” simply means the waters. From Hastings by sea it is c40 miles and passes excellent harbours such as Rye on the River Rother. After rounding Dungeness Point a landscape which has changed significantly in the 1000 years since the Norman invasion is seen, The Romney Marsh. Then passing Hythe and Folkestone; Hythe a landing place or harbour, Hede in 1086 (DB) and Folkestone, Folcanston in c657 or Fulchestan in 1086 (DB), Dover is next. Dover itself has a Motte and Bailey fortification built by Duke William just after the invasion of 1066. It is obviously correctly noted as being at the crossing point to the continent. 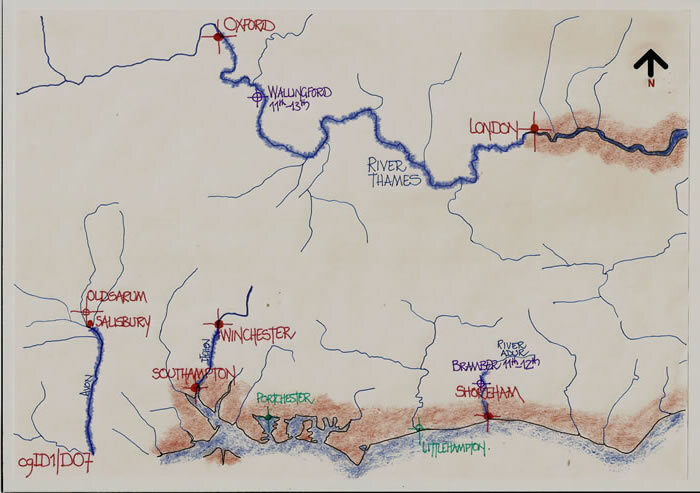 LONDRES [and its River]; Londinium, c115 (Roman), Londres is Norman and French. Lundenbyrig 457; Lundonia c730; Lundenne 839; Lundenceaster c890; Lundres c1175. Londres is described as being on the (Thames) and c90 miles from its source. Then Oxford (?) is 40 miles from London and 50 miles from the source. London is also described as being 40 miles from Dover. In fact Oxford to London along the Thames is 68 miles and Dover from London is also 68 miles along the Roman Road, Watling Street, which is now the A2. Thus there could be an error in transcription. The fact that London and Oxford are mentioned is no doubt from the fact that Robert d’Oilly built a castle at Oxford shortly after the conquest and the Tower of London is of course Duke William’s piece de resistance. The fact that London is actually ignored in the text indicates that this was a coastal description of the castles available to defend the Saxon Shore, but as I also comment the other inland towns have river access to the sea, and have a fortification, thus it is surprising that it is missing. YARMOUTH; Gernemwa, 1086(DB), ‘The place at the mouth of the River Yare’. Named Gernemwa or Gernemutha in the Domesday Book it is situated at the mouth of the River Yare which wends its way to Norwich. But the important site is actually Burgh Castle, a Motte and Bailey structure built in the walls of a Roman Fort of the Saxon Shore. It is 4 miles inland (now) upon the edge of the marshland broads and what is a river lake formed by the junction of two large rivers the Yare and the Waveney from the south. Al-Idrisi states that to sail from Dover to Yarmouth is 60 miles. This is incorrect. The route is from Dover northwards around the South Foreland passing Pegwell Bay and the ancient entrance to the Wansum Channel and the River Stour which formed the water barrier to the Isle of Thanet. This is c20 miles from Dover and as a rather large inlet could have been mistaken for the Thames Estuary. Why? When the route progresses you sail around the North Foreland and then westerly towards the Isle of Sheppey [Scepeig, 696-716 and Scape 1086(DB)] to cross the actual Thames Estuary northwards to Shoebury Ness [Sceobyrig 10thC and Soberia 1086(DB)]. This is the tidal route taking advantage of currents but it would be quite easy to think you had crossed a length of ocean and not been in an estuary. But from the Wansum Channel to Shoebury Ness is 40 miles. Thus we can postulate that the sailing distances given by al-Idrisi have been compromised or miscopied. Unfortunately there are a series of 40 mile distances along this coast which could be a cause of the miscopy. From Shoebury Ness it is a further 40 miles by sea to the safe harbour of what is now Harwich at the junction of the Stour and Orwell estuaries. Harwich was probably a Danish Military Camp. But we should not forget that inland 8 miles along the Orwell estuary is Ipswich which was noted as Gipeswic in the 10th and 11th centuries and there is Castle Hill, the site of a Roman Villa, although the name is evocative. That is because in the late 11th early 12th century there was a wooden castle built there but in 1176 it was demolished. But the other possible landfall is 15 miles further at Orford with its Norman fortification (Oreford c1164). But this coast has changed considerably as here at Orford land has been added to the coastline whilst another 12 miles northwards at Dunwich, villages have been lost to the sea. In 731 Dunwich was Domnoe and in 1086(DB) Dunevvic. It was an old Celtic name probably meaning “deep water” to which OE wic, ‘harbour, village’ was later added. The next harbour, 3 miles along the coast is Southwold, Sodwolda 1086(DB). Lowestoft follows after 11miles, Lothu Wistoft 1086(DB), and Yarmouth is a further 9 miles. Thus Dover to Yarmouth is in fact not 20+40 miles but 150 miles, and it is here that al-Idrisi states, “from the said town of Gernemutha the sea curves round in a circle, but still trending northwards”. That statement is correct if we ignore The Wash and sail from Blakeney Point, a protruding Spit, to Gibraltar Point, c30 miles across open sea. The shortest crossing of The Wash is made by travelling west along the North Norfolk coast and it is then 13 miles from Brancaster Spit to Gibraltar Point. But the conclusion to this small investigation must wait until we discuss Grimsby. NORWICH. The ‘North port or harbour town’ from North (OE) and wic (OE), ‘specialised place’, in this case ‘harbour town’. At the confluence of the Are and Wensum rivers it was an important tidal port. It was regarded as the northern counterpart of the harbour town of Ipswich, which lies 40 miles south. It was documented c930 as Northwic and in 1086(DB), Noruic. Al-Idrisi states that Yarmouth to Norwich is 90 miles; the actual distance is 20 miles. Norwich has a fine Norman Castle built 1095/1110 and it is thus one of the earliest of the more northern castles. But al –Idrisi also states Norwich is only 10 miles from the sea. There is probably a miscopy there-in. COMMENT, could the names Wansum and Wensum have been read as one and the same and thus the Dover to Yarmouth distances totally miscopied? The Wensum is the river of Norwich. As the Arabic text translation is phonetic this is a real possibility to account for the previous miss-statements. GRIMSBY. Grimesbi, 1086(DB), possibly referring to a farmstead and not a harbour or port. Here I refer you to the final sentences of the Yarmouth text and continue as al-Idrisi states “Yarmouth to Grimsby is 150 miles by sea”. Coasting it is 45 miles to Blakeney point or 60 miles to Brancaster Spit; the sea crossing to Gibraltar point is either 30 or 13 miles providing for a total sailing journey of either 75 or 73 miles to Gibraltar Point. From here to Grimsby is 40 miles by sea and thus 135 miles total. But the journey would have been broken and could be lengthened by a stop-over in the confines of The Wash at either Hunstanton, known as Hunstanestuna 1086(DB), with the Norman Castle of Castle Rising to its south, or the port of Lynn, Lun 1086(DB). Grimsby in 1086(DB) Grimesbi is at the mouth of the Humber Estuary, and is situated on the River Haven, although al-Idrisi indicates it is on the River Witham which actually flows from Lincoln via Boston to The Wash. There is obviously a complete breakdown in the order of the text, or, the original data from this point on including the singular statement that Grimsby to York is 80 miles when 50 miles would be correct. YORK. Eborakon c150; Eboracum, Eurvic 1086(DB). From being a Roman Legionary Fortress, Capital of the Empire for a while, it became a thriving Danish town, held the Archbishopric of England and was a city of 10000 persons at the Domesday Survey. It was thus second to London in size and stature. There were two Norman Castles erected here, the first by the Castellan of York, Robert fitzRichard in c1069 who was killed when it was besieged. Duke William defeated the besiegers and built a second castle, also a wooden structure which burned down. DURHAM. Dunholme c1000, but influenced by the Normans to evolve into its current form thus; Dunhelme 1122; Durealme c1170; Duram 1297. The Norman presence is a Motte and Bailey fortress (and Cathedral) dating to 1072, built by Walfheof, Earl of Northumberland. It is the most spectacular site atop a hill on a large horseshoe bend in the River Wear. It is 70 miles north of York and thus the distance given by al-Idrisi at 80 miles is very acceptable as is his statement “that it is a distance from the sea”, which at 12 miles is correct. LINCOLN. Lindum or Lindo c150; Lindum Colonia c650; Lincolia 1086(DB). As already stated there appears to be a complete breakdown in the text order and descriptions regarding Lincoln. Firstly though it is a Norman fortified site founded by Duke William who had built within the walls of the Roman Fort atop the hill of Lincoln a Norman Castle. It is unusual in that it has a double Motte to the Bailey. However Grimsby to Lincoln is only 30 miles and not the 100 miles given by al-Idrisi, unless the route is by River and sea. That is south from Lincoln along the River Witham passing Boston to The Wash and then around the coast to Grimsby. But al-Idrisi states that; ” the river flows through the midst of it (Lincoln) and flows out towards the town of Grimsby”. This is a major error and is no doubt part of the complete jumble of data hereabouts in his text. Al-Idrisi also states that from Lincoln to York is 90 miles, noting that both towns are inland, but the direct route can be measured as 50 miles. Thus it cannot be a sea route as the Lincoln to Grimsby distance is further. “From the town of York, to the estuary of the River [??] is 140 miles, and [??] is a fortress situated on this River 12 miles upstream from the sea”. The information used by al-Idrisi reads as if it is a periplus of the south and east coasts of L’Angleterre, noting all of the Castles capable of defending the shoreline from marauders. 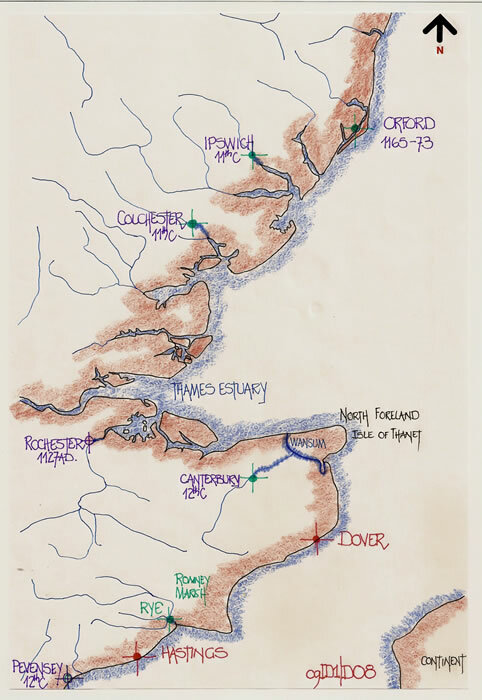 The fact that the inter-distances are so detailed would enable a Norman Fleet to gauge the timescale for each section of the sailing route to enable a rapid response. The fact that each point is a harbour and the “added” town to this list at the beginning of the text, Dartmouth proves to be a Norman Port of some importance would appear to aid this theory. Therefore where would a periplus continue to but possibly the last point along the coast in Norman hands at that period, and for some time after this texts date is relevant. The last shoreline fort, that of New Castle was built by Duke William’s son in c1080 to protect against Scots invading the north of the new domain. But we do not know the name of this New Castle as used by the Normans and thus a translation of the Arabic Script of a name hither-to unknown is fraught with difficulty. But from York to New Castle is 125 miles by land and sea and the fort is situated some 12 miles upstream on the River Tyne. The river mouth was known as Tinanmuthe c792 with the river as the Tinan this could account for Beeston’s idea of it being Boston i.e. phonetic translation. But that is speculation on my part as before, when I commented upon the Wansum/Wensum problem. From the foregoing we can evaluate the data which al-Idrisi used as coming from a sailing manual for the coastline of L’Angleterre with the added information of towns with Castles which could be accessed easily and directly from the sea via their rivers. These are mainly major defensive fortifications built at the behest of Duke William from 1066 to 1086AD. Thus there would be adequate timescale for that knowledge to be compiled and transmitted to the other Norman Monarchs, such as King Roger 2nd of Sicily. 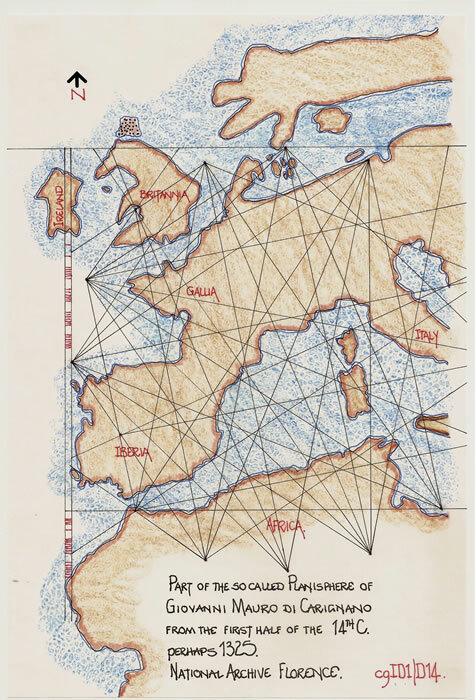 This is the data which enabled al-Idrisi in 1133 or 1134 to draw his map of the Oikoumene and write The Book of Roger. The Normans had not entered and conquered Wales and thus it was not part of the description available, nor was it included in the Domesday Book of 1086AD. Scotland was unknown territory for the Normans and a distance measure given of 150 miles from York for the end of the Scottish Peninsula is probably a guess. That Scotland was thought of as separated and therefore two islands contiguous with L’Angleterre comes from the belief that the deep Firths and Great Glen were continuous waterways and similar to the Wansum Channel in the south dividing the Isle of Thanet from Kent. King Roger 2nd of Sicily as part of the Norman family communicated with his Kinsfolk in Normandy France and those in L’Angleterre. This was so very necessary when the dates of the Christian Crusades against the Arabs in Jerusalem are taken into account. The first was 1096-99 and the second 1147-49 just after the text of al-Idrisi is written. Thus King Roger received information of the conquest of L’Angleterre and then the disposition of the Norman Fortifications built by Duke William. 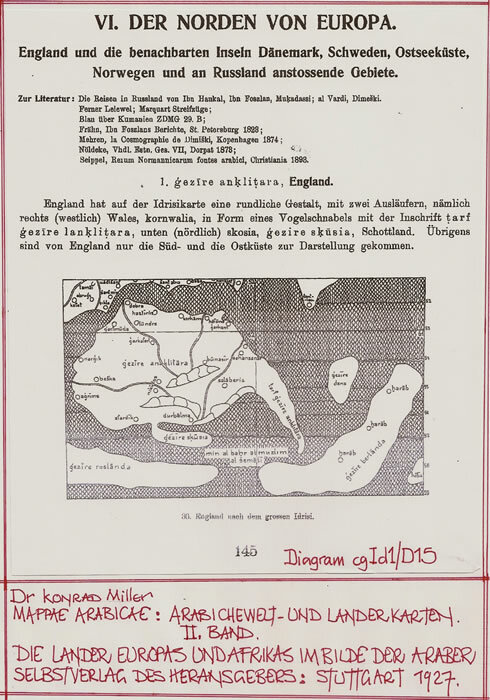 Then al-Idrisi used this information, which may have included a sketch, to formulate his description of L’Angleterre as “the Head of an Ostrich” and the western peninsula as “the beak of a bird”. If we remove Wales from a sketch of Britain the comparison is quite effective. Unfortunately it appears that the text has been miscopied and there is now confusion regarding the north-eastern littoral of L’Angleterre. But the deliberate usage of sites which are Norman strongholds is quite clear. Each appears to be a river site with a Castle just upstream. The rest is a PR exercise carried out by al-Idrisi in stating that the towns were so wonderful. It is doubted that he would have known the true state of England under the Norman yoke and even if some knowledge was available to him it is doubtful it could ever have been expressed. What is completely obscure is why King Roger 2nd of Sicily chose a Muslim Scholar to draw this great map and write the treatise on the Oikoumene. Did Roger read Arabic, he is considered a well educated person but would he have fully translated the map text let alone the actual geographical text, or was this an exercise in largesse, the portrayal of an educated and all encompassing court? His death soon after its completion probably hints at the negative. The resultant text and maps is far from that portrayed by Claudius Ptolemy and even as described 400BCE by Herodotus, and thus the data available to al-Idrisi some of which would appear to be based upon Roman Route descriptions is perhaps a strange melange. For that he cannot be blamed, but it does leave us to question the overall usefulness of the text and maps. A discussion of the shape and form of the Iberian Peninsula and its likely antecedents’ is my text cgId2. 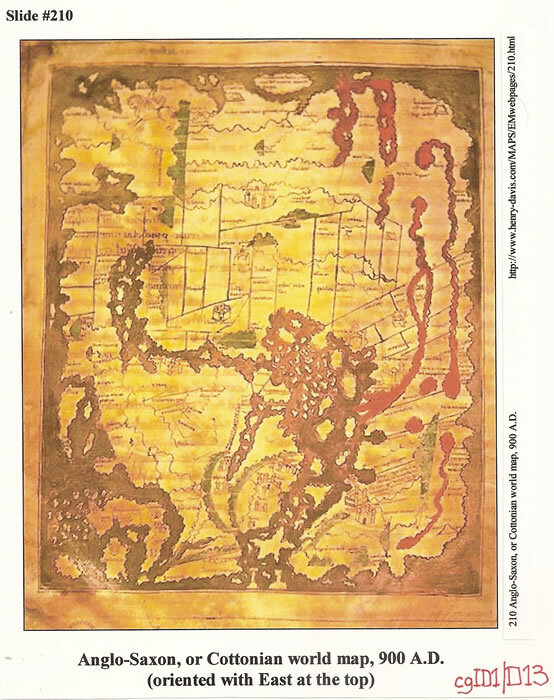 A discussion regarding the great map of the oikoumene is in my third paper, cgId3. It has already been stated that to compare the form of a country on a map to the shape of an animal requires that the map has been drawn and thus the comparison can be made. L’Angleterre has been compared to an inverted Ostrich head, which is quite the most accurate description for the shape of the Isle of Britain on the Cottoniana or Anglo-Saxon Map. The following is a description of the map. The map itself occurs in a copy of Priscians Periegesis, a 5th century manual of geography based upon an earlier treatise. The manuscript which contains the map (Cotton MSS, Tib. B. V.) is made up of various pieces, collected by Sir Robert Cotton in 1598. The map is on folio 56, and is immediately followed by a copy of Priscians latin version of the Periegesis of Dionysius, De situ terrae Prisciani Grammatici, quem di priscorum dictis exerpsit Ormistarum, written in the same hand as appears on the map. However, the map stands in no special relationship to the work that it professedly illustrates. In its presentation of the world as a whole, this map adopts a roughly square form measuring 21 x 17cm, and in this one respect it recalls some of the less desirable aspects of examples of the Beatus derivatives (slide #207, Ashburnham). See http://www.henry-davis.com, slide 210. The map is dated to around 1000AD and is thought to be a copy of a Roman World map, with perhaps a lost Roman Province map being the source of the divisions so clearly marked thereon. It was therefore drawn just prior to the Norman invasion of L’Angleterre and is evidence that the form of that land in the shape of an Ostrich Head existed to enable Al-Idrisi to quote the example in his text. Thus we can conclude that it is highly likely one of the maps acquired by Roger 2nd of Sicily was of Roman origin and that a copy of that map or one very similar was collected by peripatetic monks and transferred to L’Angleterre. The shape of L’Angleterre as described by Al-Idrisi and as discussed above probably existed before he commenced his “Geography”. But, perhaps the shape lingered on for longer than it should have, bearing in mind the maps which followed quite quickly after Al-Idrisi. Therefore I offer as an example of that probability the 1325 map by Giovanni Mauro di Carignano where the shape of L’Angleterre or Britannia is decidedly still influenced by the Ostrich Head. Loth, Catalogue of the Arabic manuscipts of the India Office Library, No 722 (a manuscript of Shaizari’s compendium of the Kitab al-buldan, containing at the end of it sections 2-10 of Al-Idrisi’s seventh climate). Oxford, Bodleian Library, MS Pococke 375. Beeston then continues with a complete discussion of the inter-linking of the various manuscripts, their family tree, and scribal changes which appear to have occurred. In his 1927 book, Dr Miller explained how he would re-assemble the 70 tableaux contained within the text of Al-Idrisi. This was to be a single map of the 7 climates and the 10 sections cojoined. 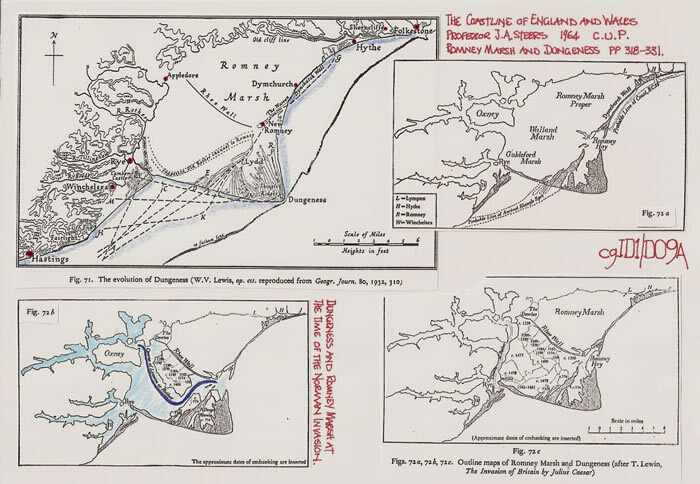 The section for L’Angleterre, pages 145 and146 are appended as diagrams cgId1D15 and cgId1D16. The tableaux redrawn by Dr Miller have latitudes appended and tableaux numbers in their corners such that the sheets can be identified. The tableaux of L’Angleterre with the Island shaped like an “Ostrich Head” are on sheets 61 and 62 with parts on sheets 51 and 52. Caution should be observed with regard to the reconstruction as the latitudes cannot be considered parallels and the manipulation to provide such does not infact come from the text of Al-Idrisi. Geographie D’Edrisi, traduit de L’Arabe en Francais d’apres 2 manuscits de la Bibliotheque du Roi et accompagnee de notes. Par, P. Amedee Jaubert. Paris MDCCCXC. Tomes 1 et 2. The complete text of both Tomes is available as a Google download as well as the 4th Climate which is available at Lacus Curtius/Thayer, which is a copy of the French text by Reinhart P A Dozy and Michael J de Goeje. Beeston A F L, 1950, Idrisi’s Account of the British Isles. Bulletin of the School of African Studies, University of London, Vol 13, No 2 pp265-280. Dunlop D M, 1947, Scotland According to al-Idrisi, AD1154. The Scottish Historical Review, Vol 26, No 102, Part 2, pp 114-118. Stevenson W B, 1948, Idrisi’s Map of Scotland, The Scottish Historical Review, Vol 27, No 104, Part 2, pp202-204. Bibliotheque Nationale de France, Departement des Manuscits, Division Orientale, Cote:Arabe 2221, Auteur Titre Idrisi, Nuzhat al-mustaq fi ihtiraq-al-afaq. Images 1-69 et planche contact 1-8. Available for download. The Penguin Atlas of British and Irish History, 2001. Penguin Books, London. The Penguin Atlas of World History, Volume 1, 1974. Penguin Books, London. There are numerous histories that have been consulted for the background research into this part of the text of al-Idrisi particularly concerning the Norman Invasion and their forebears. To denote each is not practical as it concerns the whole of European History from 1000AD to the First Crusade and beyond. Thus it will be necessary for researchers to consider just how much knowledge is necessary to establish the reasoning behind the al-Idrisi text if this highly researched though simplistic presentation is not accepted. M J Ferrar August 2012. The following text is available on line at; http://idrisi.narod.ru/salam.htm. It is included as it pertains to my texts cgId1 and cgId2. That is the British Isles and then Iberia. 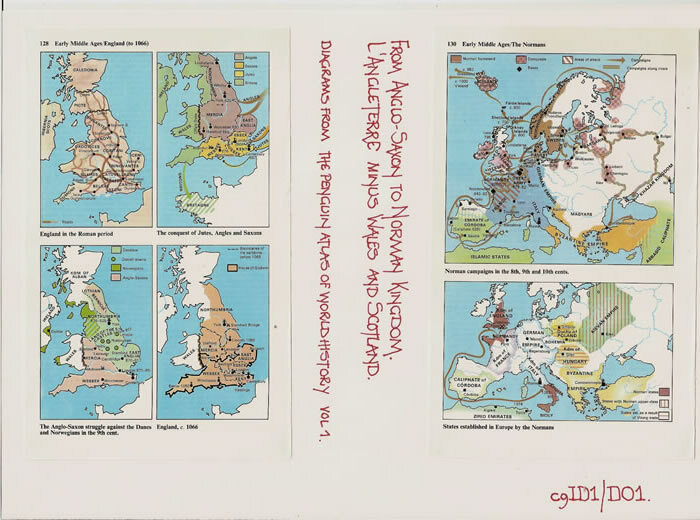 *The British Isles According To Medieval Arabic Authors – Part Four *_ *D. M. DUNLOP* Apart from his main account, there are a few other passages bearing on Britain scattered through al-Idrisi’s great work. Such, for example, is a short passage at the end of the 2nd Section of the 6th Clime, where he rehearses the information about England, especially its towns, which he is going to give in the 7th Clime (the main account). A new detail is the statement that the passage from the Continent to England was made from Sanqulah, i.e. apparently St. Nicholas. The place is described elsewhere in the same section as a town near the sea, on the banks of a river and at the head of the gulf of Sanqulah, i.e. apparently St. Nicholas on the Escaut. Again, at the end of the 1st Section of the 6th Clime, after describing Brittany, al-ldrisi continues: ‘These countries being bathed on the west by the Sea of Darkness, there come continually from that direction mists and rain, and the sky is always overcast, particularly on the coast. The waters of this sea are covered with cloud and dark in colour. The waves are enormous, and the sea is deep. Darkness reigns continually, and navigation is difficult. The winds are violent and towards the west its limits are unknown. In this sea are a number of inhabited islands, but few sailors dare to risk their lives therein. Those who do, though they have knowledge and bravery, sail only along the coast without going far from land. The time for these expeditions is restricted to the months of August and September. The principal sailors of this sea are those who are called the English (al-Inklisn), or inhabitants of England (Inkirtarah), a large island, which contains many towns and inhabited places, fertile fields and rivers, and which we shall treat of in more detail later, if God will. In spite of all that is terrifying in this sea and in spite of its cloud-covered waves, it contains many excellent fish, and fishing goes on in various places. There are also sea-animals of such size that the inhabitants of the inner isles employ their bones and vertebrae instead of wood for building houses. They also make from them clubs, lances, spears, daggers, seats, ladders, and other things which elsewhere are made of wood. Al-Idrisi has another passage on similar lines at the beginning of the 1st Section of the 4th Clime, where he is less explicit about the English sailors and the extensive use of whalebone, apparently, in the ‘inner isles’. ‘The greatest width of (Spain) is about 17 days’ journey, starting from a promontory in the extreme west, ‘where ends the inhabited portion of the land surrounded by the Ocean. No one knows what exists beyond this sea, no one has been able to learn anything for certain, because of the difficulty of crossing it, its profound darkness, the height of its waves, the frequency of its storms, the prevalence of its animals (? whales) and the violence of its winds. There is, however, in this Ocean a large number of islands, inhabited or desert, but no ship’s captain ventures to cross it or to travel under full sail. They are limited to coasting, without losing sight of land. The waves of this sea are as high as mountains, and although they are in violent commotion, remain nonetheless whole, not breaking in pieces. If it were otherwise, to cross them would be impossible.’ Elsewhere al-Idrisi actually identifies the Sea of Darkness and the Sea of the English (here bahr al-Inqlishin). Relevant also to our subject, it would seem, is al-Idrisi’s account of the so-called Adventurers (al-Mugharrirun), who sailed from Lisbon into the Atlantic at an unspecified date on a voyage of discovery. There were eight of them belonging to one family (literally ‘cousins’), and they built a transport ship, on which they put aboard water and provisions for several months. Setting sail ‘when the East wind begins to blow’, they reached, after ‘about eleven days’, ‘a sea with huge waves and thick clouds, with numerous reefs scarcely illumined by a feeble light’. Realizing their peril, they changed direction and ran with the sea towards the south. The older translation of Jaubert,^/*”10″*/ retained by Dozy and De Goeje, conceals the fact that this is evidently a description, real or imaginary, of some northern shore. More than this one would not care to say, but it could be that the Adventurers reached some dangerous point on the Irish or English coast. Their voyage southwards, which does not concern us here, is represented as more rewarding. Whatever the details amount the fact of this expedition seems vouched for. Al-ldrisi states the existence at Lisbon of a street called after the Adventurers Darb al-Mugharririn. As to dating, the expedition must have taken place before 543/1148, when Lisbon was captured by the Christians. For Khashkhash (3, 13) as the leader of the Adventurers see next parag. *20*. Ibn ‘Abd al- Mun’im al-Himyari in ar-Raud al-Mi’tar, a work which in its final form was completed as late as 866/1461, but which was drafted in a version already in the seventh or beginning of the eighth century A.H., has a passage on the Ocean, as follows: ‘Ocean is the name of the Sea of Darkness, and it is called the Green Sea and the Encircling Ocean, whose end and extent are not known. There is no creature therein . . . . There risked his life Khashkhash of Spain, who was a young man of Cordova, with a company of other young men of the same place. They embarked in ships which they had equipped and entered this Ocean. They were absent in it for a time, then came back with rich booty and well-known stories [sic]. ‘All that is sailed of this sea is near the west and the north (cf. n. 6, Z~. 2 I), and that is from the farthest point of the land of the Blacks to Britain, which is the great island in the farthest north. And in (the Ocean) are six islands opposite the land of the Blacks, called the Eternal Islands. Then no one knows what is after that. Hereafter, if God will, another story will be given concerning those who entered this sea, longer than This, at its place in the notice of Lisbon.’ This presents a cento, in which the first part is evidently al-Mas’udi (cf. the long passage cited 13) and the second al-Battani (cf 9). The story of Khashkhash is from al-Mas’udi, as the wording shows, unless we are to assume a common source. The ‘other story’ is that of the Adventurers, given by Ibn ‘Abd al-Mun’im in al-Idrisi’s words, practically verbatim. The last sentence of course is Ibn ‘Abd al-Mun’im speaking sua persona. Levi-Provencal believed that this Khashkllash, said to be of Cordova, could be identified not only with Khashkhash b. Said b. Aswad of Pechina (southeast Spain) who formed part of a deputation of sailors in 276/889-90 and Khashkhash who shared the command of the Umayyad fleet against the Norsemen in 245/859 (see 3), but also with the anonymous leader of the Adventurers mentioned by al-Idrisi. This construction seems very difficult, though perhaps possible. It makes a man who had held part command of a fleet, act with his father on an embassy thirty years later. Another difficulty seems to be to connect Khashkhash with Lisbon. It is not very likely that a street in Lisbon should commemorate the Adventurers, unless they were natives of that city. But if so, they had nothing to do with Khashkhash, allegedly of Cordova, but perhaps really of Pechina. Ibn ‘Abd-al-Mun’im appears not to connect the two stories. Perhaps we should reckon the voyages of Khashkhash and the Adventurers, with that of ‘Abd ar-Rahman b. Harun already mentioned (11), as having been related separately in one of the lost works of al-Mas’udi (cf. 13). *21. * Abu’1-Fida’ in his Geography (finished 721 / 1321) has the following: ‘In the Sea of Burdil (Bordeaux) is the island of Britain.’ Elsewhere he gives a longer account: Of the islands of the seas which branch off from the Encircling Ocean is the island of Britain (Bartaniyah) in the Sea of Burdil (Bordeaux), which is a sea going out in the north of Spain. In this island there is no water except from the rains, and depending upon this they sow their seed.’ It would appear that the ‘island of Britain’ is here Brittany, distinguished rather insufficiently, since the proper name is the same, from the ‘islands of Britain’ (also Bartanyah), which are now eleven in number, i.e. evidently twelve as before less Brittany. The passage continues: ‘And the islands of Britain are eleven islands. Of the famous islands is the island of England (Inkiltarah). Ibn Said said: And the ruler of this island is called al-Inkitar in the History of Salah ad-Din (Saladin) in the wars of ‘Akka (Acre). His capital in this island is the city of Lundras (London). He continued: And the length of this island from south to north, with a slight inclination, is 430 miles. Its width in the middle is about 200 miles. He continued: And in this island are mines of gold, silver, copper, and tin. There are no vines because of the sharpness of the frost. Its inhabitants bring the precious metals of these mines to the France, and exchange them for wine. The ruler of France has plentiful gold and silver from that source. In their country (sc. England) is made the fine scarlet cloth from the wool of their sheep, which is fine like silk. They place coverings over the animals, to protect them from rain, sun, and dust. In spite of the wealth of al-Inkita r and the extent of his kingdom, he admits the sovereignty of al-Faransis (the French king), and when there is an assembly, he performs his service by presenting before (the ruler of France) a vessel of food, by ancient custom. In the north of island of England and somewhat north of Britain is the island of Ireland (Irlandah). The extent of its length is about twelve days, and its breadth in the middle is about four days. It is well known for its numerous disturbances (fitan). Its people were Norsemen before they became Christians, following their neighbours. From it is exported much copper and tin. . . . And among the islands of the Encircling Ocean is the Island of Tuli (Thule), which is in the North Encircling Ocean. It is the extremity of habitation in the North.’ Another passage confirms what has been here said about the export petals to France. ‘Ibn Said said: And to the east of Bordeaux is the city of Toulouse…. The river (sc. Garonne) is south of it, and ships from the Encircling Ocean ascend it, with tin and copper, which they bring from the island of England and the island of Ireland. It is carried on pack-animals to Narbonne, and taken from there on the ships of the Franks to Alexandria.’ Abu’l-Fidd’ is clearly under heavy obligations here to Ibn Said al-‘Maghribi (c. 610/1214-673/1274), who evidently had new and somewhat accurate information about the British Isles. Al-Inkitar (parallel, apparently, to al-Faransis for the king of France) may be due to a mistake. The historian Baha’ ad-Din b. Shaddad, whose work is here quoted, spoke of malik al-Inkitar, so that al-Inkitar is simply ‘England’ (though indeed the form may have been current as Ibn Said used it). The account of Ireland is curious. The statement of Ireland’s late conversion to Christianity is of course the reverse of true. *22. * Having admitted the notices of Britain in the Persian Hudud al-‘Allam (16), we may also include here a notice from the Jami’ at-tawarikh of the celebrated Persian historian Rashid ad-Din especially since it qualifies for admission as having appeared in Arabic as well as Persian. The passage has been taken over practically as it stands by Banakati, whose Raudat uli’L-albab, usually simply Ta’rikh-i Banakati, appeared in 717/1317, i.e. a few years after the Jami’ at-tawarikh itself (completed by Rashid ad-Din in 710/1310-11). It runs as follows: ‘Opposite this land (Spain) in the midst of the Encircling Ocean are two islands, of which one is Ireland (Ibarniya). From the special nature of the earth of that country poisonous reptiles die, and mice are not born there (tawallud na-mikunad). The men there are long-lived, red-complexioned, of tall stature and powerful frame, and brave. In this country is a spring of water, in which if one places a piece of wood, in a week its surface becomes petrified. The name of the larger island is Anglater (England). In this country are many remarkable mountains, innumerable mines of gold, silver, copper, tin, and iron, and different kinds of fruit. Among the marvels of that land is a tree which produces a bird as fruit, in the following manner. In the time of blossom a bag like an apple forms, within which is a thing shaped like a bird. When it grows big, it becomes alive and comes out. They keep it and eat the fruit, till it is the size of a large duck. The meat of the people of that land is mostly from that bird. They relate that among the Christians, who at the time of the fast eat no animals, there is a disagreement in regard to eating it. Some consider it as one of the plants, since it is the fruit of a tree, while others regard it as an animal, since blood comes from it. In those two islands there are sheep from whose fleece come “Jerusalem wool” (suf Q,udsi ) and exceedingly fine scarlet cloth. The ruler of both islands has the name Squtlandyah (Scotland) [sic], and they pay tribute to Anglater. The ruler of that land (France) they call Riddfrans (Rol de France) and Anglater, the ruler of the isles, is tributary to him.’ There is not much that is new here (Cf. 21). But Rashid ad-Din had access, presumably not directly, to Medieval Latin legends. Thus we find here the old story that there are no snakes in Ireland, alongside of the barnacle goose in a disguised form. It is yet more remarkable that Rashid ad-Din knew about Merlin, if not by name. Ibn Khaldun (732/1332-808/1406), who, as is well known, took over an extensive amount of al-Idrisi into his Muqaddimat, mentions England once or twice, but does not reproduce al-Idrisi’s full text. *24.*. Al-Maqqari in his celebrated work Nafh at-lib (completed 1039/1638) has a passage as follows. ‘And in the Encircling (Ocean) are the Eternal Isles, seven islands west of the city of Sala. They appear to the observer on a clear day, when the air is free from thick vapours. On them are seven idols of the likeness of men, which point out that there is no passage and no way beyond them. In (the Ocean) in a northerly direction the Islands of the Blest, where are cities and villages uncountable. From them come forth (in the 17th century!) a nation called Norsemen, who are Christians. The first of them (sc. the islands in question) is the island of Britain (sc. Brittany, Cf. 21). It is in the midst of the Encircling Ocean, far to the north of Spain. No mountains or springs are there. They drink rain-water, and sow their seed depending upon it.’ This presents a farrago of ancient and modern lore. The basis in al-Battani is not hard to discern (cf. 9). The Eternal Isles, which are mentioned here with talismans strongly reminiscent of the ‘Pillars of Hercules’ (cf. above, ad init. ), are distinguished from the Isles of the Blest. The Norsemen appear from these last. At the end is an echo of Abu’l-Fida’, rather Ibn Said (cf. 21). It is somewhat remarkable that al-Maqqari quotes this from the Egyptian author Ibn Iyas who on his own subject, the history of Egypt, is a very respectable author. A passage from the Spaniard ar-Razi with a brief mention of Brittany (see 14) is also quoted by al-Maqqari. *25. * Reserved to the last place in this survey because its date is uncertain is an Arabic translation of the Geography of Ptolemy which was published in facsimile by Prince Youssouf Kamal in 1929 . The manuscript from which the facsimile was taken is Aya Sofya 2610, but the origin of the translation remains something of a mystery. It is presumably of a copy of the translation of Ptolemy’s Geography made by Thabit b. Qurrah in the 3rd/9th century. Prince Youssouf Kamal tentatively advanced his opinion that the Arabic is a translation of a Greek manuscript of Ptolemy’s Geography, which is believed to date from the end of the fourteenth or the beginning of the fifteenth century A.D., and was actually the work of the person who had previously copied the Greek manuscripts. The Arabic manuscript bears the seal of the Ottoman Sultan Bayazid II (1481-1512), according to Prince Youssouf Kamal. A longish preamble to the translation mentions no names, but the recipient was perhaps an Ottoman ruler (al-malik al-a’la wa’s-sultan al-jalil), so called by some client of his who had been specially selected for the task (‘abduhu al-maghrus bi-aidi al jud wa’l-karam li-hadhihi l-khidmah). The translation appears to be a good one, e.g. the passage about the famous ‘Caledonian wood’ in Britain (o KaAqBovcos Epuuos) comes out distinctly: zoa-min al-khalij al-Lamanun yus [sic] Q,aladhun yun wa fauquhum ghab Qaladhuni ilkh. The suggestion of the work having been specially made for an Ottoman Sultan is probably confirmed by the statement of Hajji Khalifah (died 1068/ 1658) that no copy of the Arabic translation of Ptolemy’s Geography was now known to exist. This completes our survey of passages in the medieval Arabic authors bearing on the British Isles. It will have been seen that Ptolemy’s ‘Albion’ and ‘Hibernia’ are soon replaced by Britain and Ireland, and ultimately England and even Scotland (both in al-Idrisi for the first time) have distinct identities. The best accounts in Arabic which we have of the British Isles – apart from Ptolemy in translation – are given by al-Idrisi and Ibn Said al-Maghribi, Abu’l-Fida’ (19 and 21) . As the middle Ages proceed, the tendency to garble the older data is on the increase. This is very obvious in the passage from Ibn Iyas (24), and more extreme cases could be cited. At the end of the middle Ages less was known, it would seem, at least theoretically, about the British Isles than at the beginning. This result, however, is incidental. The purpose of the inquiry has been to establish, if possible, the existence of records in Arabic of direct contact with Britain. The result, as will have been seen, is almost entirely negative. Possible contacts with the south or west coast of Ireland are as much as can be affirmed (2, 11, 18, 19). A similar contact with the coast of England is not excluded (19). It may be asked, Is there anything in English or Irish historical notices which would support the view that such contacts may occasionally have occurred? What there is amounts to very little. We find indeed an unconfirmed mention of the Moors in Domesday Book, as sojourners or settlers in London, i.e. in 478/1085. It has also been claimed that Arabic characters were to be seen on tombstones at Peel in the Isle of Man in the eighteenth century. Since the stones in question appear now to have been cleared away, it is no longer possible to examine the evidence on which this statement was based. But it would certainly seem that until some evidence is produced, the claim can safely be neglected. 1. A. Jaubert, Geographie, d’Edrisi, ii, Recueil de voyages et memoires, t. 6 (Paris, 1840), p. 374, cf.p.366 2. Ibid, pp. 355-6. The passage is lacking in the so-called Geographia Nubiensis (Rome, 1592) and in Ibn Khaldun, Muqaddimat, ed. Bulaq-Beirut, p. 77. 3. Apart from al-Idrisi here and below (n.3, p.22), a similar expression is found once only, so far as I know, viz. in Levi-Provencal, La Peninsule iberique au Moyen age d’apres le Kitab al-Rawd al-mitar, etc.,p.36,… on ne parcourt couramment de l’Ocean que la partie qui longe la terre, a l’Occident et au Nord, c’est-a-dire, depuis les confins extremes du pays des Noirs jusqu’a la Bretagne, la grande ile qui se trouve a l’extreme Nord. But it is there a question of translation. The Arabic text (p.28) has simply: /wa-innama yurkabu min hadha ‘l-bahr mimma yali ‘l-maghrib wa’sh-shimal, wa-dhalika min aqasi bilad as-Sudan ilka./ 4. For whaling in British waters cf. 18. 5. Jaubert, op. cite, p. 2; text in Geographia Nubiensis (unpaginated). 6. Al-Idrisi appears to say the same thing as before (cf. n. p.21). 7. Jaubert op. cit. p. 231. 8. Apparently the correct form and not al-Maghrurun (=the Deluded). Cf. al-Mas’udi, Muruj, i. 258: /qad ataina ala dhikriha fi kitabina fi akhbar az-zaman wa-fi akhbar man gharrara wa-khatara binafsihi ilkh./ 9. Jaubert op. cit. pp. 26-27, cf. i.200. 10. Instead of a sea with huge waves, etc. Levi-Provencal’s translation, Peninsule iberique, p. 23, cf. 20 – Jaubert gave une mer dont les ondes epaisses exhalaient une odeur fetide, cachaient de nombreux recifs, et n’etaient eclairees que faiblement, op. cit. p. 27; cf. Description de l’Afrique et l’Espagne par Edrisi (Leiden, 1866), p.223. 11. Al-Qazwini, ii. 373. 12. E. Levi-Provencal, La Peninsule iberique au Moyen age d’apres le Kitab al-Rawd al-mitar d’Ibn Abd al-Mun’im al-Himayari, Publication de la Fondation de Goeje, No. XII (Leiden, 1938), p. xv. 13. Op. cit, text, pp. 28-29, transl., p.36. 14. Peninsule, text, p. 16; cf. 19. 15. Levi-Provencal, Peninsule, transl., p.36, n.3 quoting Ibn Haiyan, Muqtabis, ed. Antuna, p. 88; cf. Histoire de l’Espagne (1944), p. 249, n.I. 16. Levi-Provencal, Histoire de l’Espagne, iii (Paris, 1953), p. 342, n. I, quoting an unpublished part of Ibn Haiyan’s Muqtabis. 17. This was suggested by Levi-Provencal in 1953 (see previous note). 18. There are some minor inaccuracies in the various passages where Levi-Provencal discusses Khashkhash. The deputation of which Khashkhash b. Sa’id b. Aswad of Pechina formed a member was not sent by Sawwar b. Hamdun (Peninsule, p.36, n.3), but to him. The story of Khashkhash, as is clear from the Mas’udi passage in which he is mentioned, is older than al-Bakri, twice mentioned (in Histoire de l’Espagne, ed. I, p. 249, n. I, and again in vol. iii, p. 342, n. I) as the source. (Al-Bakri is 5th/11th century). 19. Cf. 19, end. 20. Reinaud, Geographie d’Aboulfeda, text, p. 35. 21. Ibid, text, p. 187 22. 9, 13, etc. 23. Cf. Recueil des historiens des Croisades, Historiens Orientaux, vol. iii (Paris, 1884), an-Nawadir as-Sullaniyah by Baha ad-Din b. Shaddad, pp. 214, 220. 24. Reinaud, op. cit., text, p. 219. 25. Cf. another possible example in 22. 26. After and not before Abu ‘l-Fida, as might seem more correct. But Rashid ad-Din was apparently dependent on Ibn Sa’id al-Maghribi, cited by Abu’l-Fida. 27. Recently edited by K. Jahn, Histoire universelle de Rasid al-Din, etc. i, Histoire des Francs (Leiden, 1951), pp. 4-5. Professor A.J. Arberry of Cambridge University kindly drew my attention to the account of Rashid ad-Din, which is referred to briefly in E.G. Browne’s Literary History of Persia, iii. 43-44. 28. It is well known that Rashid ad-Din took measures within his lifetime to have his Persian works put into Arabic and vice versa (Browne, op. cit., p. 77). 29. See a French translation of the passage from Banakati in D’Ohsson, Des peuples du Caucase (Paris, 1828), pp. 262-75 (not mentioned in C. A. Storey, Persian Literature, ii. i. 80). 30. i.e. the king of England, cf. immediately below Anglater, the ruler of the isles’, and similarly Squtlandiyah for the king of Scotland. It is somewhat striking that the usage is the same apparently in Abu’1-Fida’ (Ibn Said al-Maghribi) (see 21), though there al-inkitar, cf. also al-Faransis. 31. Jahn, txt, p. 25; transl., p. 41 and n. I. 32. Muqaddimat, ed. Bulaq-Beirut, pp. 77, 80. 33. Ed. Leiden, i. 104. 34. Cf. Gayangos, op. cit. i. 378, n. 4. The work in question is Nashq al-azhar fi aja’ib al-aqtar (Brockelmann, G.A.L. ii. 295), which doubtless made use of Ibn Said al-Maghribi. 35. As a special supplement to the series Monumenta Cartographica Africae et Aegypti. 36. Cf. 8. 37. Youssouf Kamal, Quelques eclaircissements epars, etc. (Leiden, 1935), p.30. 38. The effective part of Hajji Khalifah’s notice (Kashf az-zunun, ed. Flugel, ii. 602) is wa-qad arrabuhu fi ahd al-Ma’mun wa-lam yujad alana ta ribuhu. 39. A note to chapter iv of Lord Lytton’s Harold. 40. So Waldron’s Description of the Isle of Man, fol. 1731 (reprinted by the Manx Society, vol. xi (1865), p.11). I AM DELIGHTED TO ACKNOWLEDGE THE HELP GIVEN BY ALASDAIR WATSON, SENIOR ASSISTANT LIBRARIAN, MIDDLE EASTERN AND ISLAMIC MANUSCRIPTS AT THE BODLEIAN LIBRARY OXFORD, WHO RE-TRANSLATED SECTIONS OF THE ORIGINAL ARABIC TEXT AND THEN TRANSLATED AN ARABIC TEXT EMAIL WITH GREAT COURTESY AND VERY SPEEDILY. SINCERE THANKS.